The need and demand to feed the ever-increasing global population pose major challenges for increasing crop productivity in an eco-friendly manner. The cultivation of crops under input-intensive conditions has however resulted in an enhanced vulnerability of high-yielding cultivars to a multitude of pests and pathogens at all phenological stages. The disease spectrum and intensity are continuously changing because of the dynamic nature of crop systems, pests and pathogens. Disease management has therefore become the major functional component of the crop production systems. 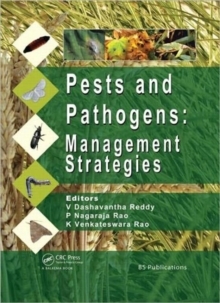 This reference volume and manual covers the complete spectrum of current issues in pest and pathogen disease management:Insect pests: pathogens of rice, sorghum, chickpea and castor and their management;Molecular marker-assisted breeding and transgenic crops for disease management;Management of forest insect pests;Effect of climate change on insects, pathogens, plants and pesticide usage;Botanicals & microbial pesticides and insect resistance to synthetic pesticides, andIntegrated pest management and bioinformatics' solutions. The text is supported by a full color photograph section. Most chapters represent studies down in India and South East Asia. Scientists and practitioners working in other subtropical and tropical areas will also benefit from the information and strategies provided in this volume. Edited by three experienced specialists, this volume will benefit researchers and professionals in crop science, plant diseases and bioinformatics.